A pioneering entrepreneur among today’s container ship giants, Jaques Saadé was the founder and driving thrust behind the third largest of these companies, CMA CGM. The others, Maersk Line of Copenhagen, controlled by A P Moller and MSC of Geneva, controlled by the Aponte family, are the others. All three are family-controlled firms. Today, CMA CGM Group announced the death of Jacques Saadé, founding president of the CMA CGM Group, at the age of 81 on June 24, 2018. Saadé dedicated his life to CMA CGM. An extraordinary visionary and entrepreneur, he made the Group into a world leader in container shipping, expanding the company to more than 160 countries, while maintaining it as a family enterprise. And, unknown to many, 118 of his ships carried a few passengers on ther rounds. After moving from Lebanon to Marseilles in order to protect his family from Civil War, Saadé founded the Compagnie Maritime d’Affrètement (CMA), on September 13, 1978. This move anticipated major developments in world trade, in which the container has played a determining role. He began with four employees, a single ship and one line between Marseilles and Beirut. Then began the company’s extraordinary development. Having started a Transatlantic service using two chartered ships, in 1983 he sent his first ships beyond the Mediterranean to transit the Suez Canal. In 1986 he launched a service linking North Europe to Asia, and in 1992 opened CMA’s first office in Shanghai. His vision that China was the place to be turned out to be correct. His strategic acquisitions thereafter allowed him to strengthen the company’s presence in key markets : CGM in France in 1996, ANL in Australia in 1998 and Delmas to Africa in 2005. By 2006, CMA CGM was the third largest container shipping company in the world. In 2015, he was named a Commander of the French Legion of Honor by the President of the Republic. On February 7, 2017, on his 80th birthday, Jacques Saadé, appointed his son Rodolphe to the position of chief executive officer of the CMA CGM Group and then as chairman of the board on November 24 of the same year. Meanwhile, along with the millions of container movements, passenger services arrived in 1996. 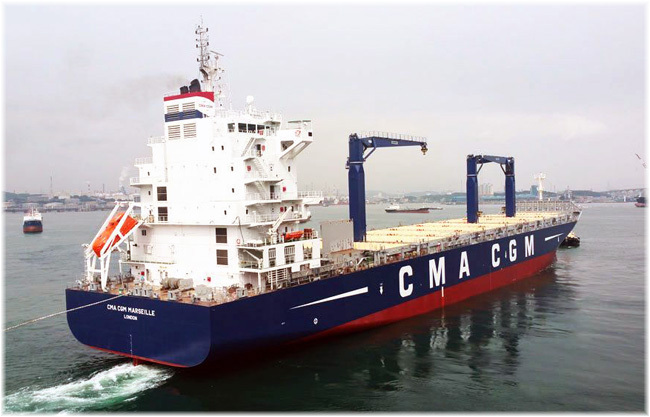 This followed the French government’s privatised of Compagnie Générale Maritime (CGM), with CMA acquiring the state-owned company to form CMA CGM, based in Marseilles. The initial passenger services were round-the-world and to the French West Indies, and grew from there, most notably in the Europe-Far East trades. Between 2006 and 2012 CMA CGM also featured in its portfolio Ponant Cruises, which had been founded in 1988, and added to its fleet of small cruise ships, then consisting of Le Ponant, Le Levant and Le Diamant. 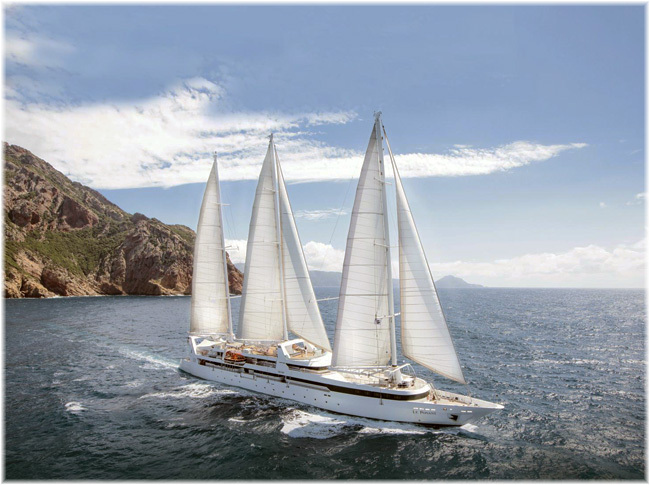 This trio was joined in 2011 by two new 264-berth ships named L’Australe and Le Boréale, with two more to follow as Ponant was sold on to venture capital interests. In commemoration of CGM’s illustrious maritime history, that included such famous ocean liners as the Paris, the Ile de France, the Normandie, the Liberté and the France, that Jacques Sadée decided after the acquisition of CGM that new cargo ships would continue this tradition by being outfitted to carry passengers on voyages worldwide. As well as being the third largest container line in the world, after Maersk and MSC, with 490 ships on 200 routes, CMA CGM thus continues a strong tradition of carrying passengers, with100 ships equipped with passenger cabins and more on the way. During 2017 and 2018, CMA CGM also added eighteen APL ships to its passenger roster, giving it by far the largest fleet of passenger-carrying container ships in the world. Passengers who travel with CMA CGM enjoy all outside cabins and take breakfast in their own lounge while lunch and dinner is taken with the officers. The line’s passengers are also allowed on the bridge, where they learn about the starts and navigation as well as satellite navigation. The company flagship, the 18,000 TEU CMA CGM Antoine de St Exupery, on the Europe-Far East run, carries passengers in two 409 sq ft VIP suites costing €200 per person per day.